Located right in the center of the Las Vegas Strip, The LINQ Hotel & Casino is the social hub for trend-setters and partiers alike. 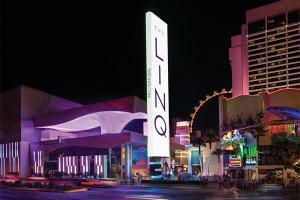 Rooms include cutting-edge technology, modern furnishings and close access to the LINQ outdoor shopping district. This hotel offers a collection of hip rooms and suites renovated with contemporary design touches and high-tech features. Located on the Las Vegas Strip, home to exclusive shopping, gourmet dining and upscale entertainment. Guy Fieri's Vegas Kitchen & Bar, Hash House A Go Go, Chayo Mexican Kitchen + Tequila Bar - Mexican cuisine, Off The Strip - Dining and bars, Yard House - Classic American food, The Tilted Kilt Pub & Eatery.